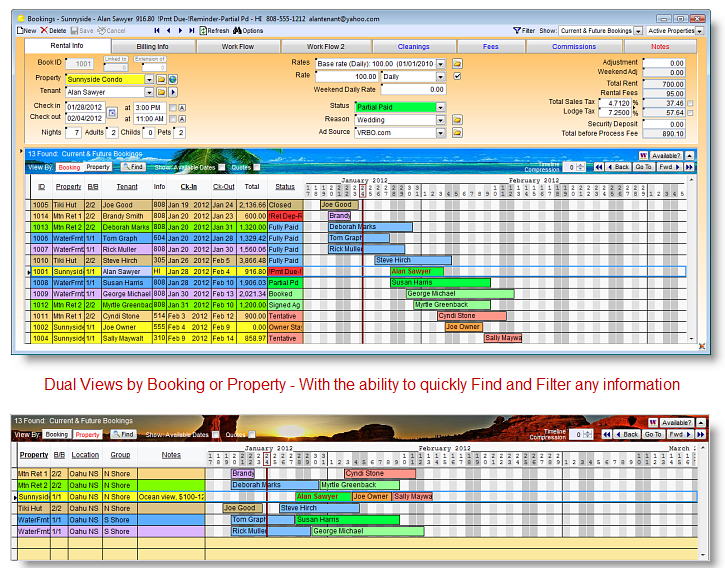 Everything you need to efficiently book, manage and advertise your vacation rental properties. See the product website for complete details, a slide show, and a free evaluation download. Vacation RentPro Reviews Recently Reviewed! Pros: This software keeps my calendars, cleaning schedules, and my finances straight. It interfaces with other booking channels to synchronize the calendars, it has great reporting functionality, and it has some great tools that allow me to send professional looking communications to my guests. It interfaces perfectly with my vacation rental website. It's reliable and powerful. It does the bookkeeping and housekeeping jobs very well for my small vacation rental business. The best part about it is that there are no recurring monthly charges to be able to use it; only yearly update fees. There's excellent online support that walks you through anything you need. It's user friendly and I highly recommend this product, especially if you primarily use third party channels like airbnb to rent your vacation rental properties. Payment processing is an integrated function in this software through a third party system. That's handy if you rent your property through channels that don't process the payments for you. Cons: It's a little cumbersome to process a direct booking with this program, but it can be done. The communication tools are all there. Thank you for your feedback. I believe you're referring to creating a booking manually when you mention "process a direct booking". There are various ways to create a booking manually (if the booking is not imported). For example, you can use the Floating Calendar to read all the information from an inquiry, and then click the "Create Booking" button in the Floating Calendar. You can also use the "Options" button at the top of the Bookings form, to quickly create owner stays, Block out bookings, or you can duplicate a booking and then change whatever needs changing (Tenant, dates, etc). Call if you need any help. Thank you. Cons: does not offer direct interface to Airbnb and Trip Advisor is upload only It does interface with middlemen type sites like red awning and booking pal. Comments: I've been using this for 2 years for our property management business and it is very easy to use, the tech service is immediate and it does most of what I need it to do including updating calendars on both VRBO and Flipkey as well as rates on VRBO. My only complaint is it is not web based so I need to keep a separate calendar I can access if away from the computer. I use it through Parallels on a Mac and would love if it were also Mac friendly. Thanks for your review Walt. Please see the "Private View Bookings List" feature in the software's Help document. This feature allows you to view a 15 month sliding timeline of availability for all your properties, from anywhere (on a phone, tablet or any browser) as long as you have web access. It also includes brief information on each booking. You can see examples of it on the software's website. There's a lot of features in the software and often times people just haven't discovered them yet. Feel free to contact us if you have any questions. Also, regarding a Mac version, there are a lot of features in the software that utilize functions and features in Windows, which would not be available on a Mac, so it's best for people to use Parallels on a Mac and that way we can continue to improve the product rather than diverting lots of time and resources rewriting the app for Mac and supporting 2 completely different platforms. Cons: The big cons with RentPro is that they are not available in the cloud, however, some people do still prefer to keep all their data safe on their own PC. If you are that type of person RentPro is a good solution. Overall: I was able to keep a good track of my holiday letting business. Thanks for your review. Many of our customers who require remote access use 3rd party cloud services with Vacation RentPro (such as TrappOnline), or other tools like Team Viewer, Windows Remote Desktop with Windows Server or Citrix, Logmein, etc.